It is my privilege to greet you for the first time in this beautiful new Amphitheater as the 18th president of Chautauqua Institution. To say that this day surpasses any surreal dream I might have had for my life is an understatement. Thank you, Jim, and to the entire board of trustees for your faith and confidence in asking me to serve this sacred place. Thank you in a very special way to the members of the search committee, who journeyed with me for months before anyone else knew who I was or that I was even a candidate. Thank you to the incredible staff of Chautauqua Institution; what a gift it is to serve with each of you. Thank you, Father Francis (Di Spigno), for connecting my love for Chautauqua with my deep and abiding love for St. Bonaventure University and my own Franciscan journey. Your blessing will sustain me for all my days of service here at Chautauqua; you uniquely know what it means to me to have you here today. I’m profoundly touched and grateful. While I hope that’s a long, long way off, thank you to my dear friends Shannon, Steve, Deron, Richard, Lisa, Brian and Kristan, my godson Ben, my exchange son Alen and my partner, Peter, for helping me celebrate the start of what will, by any objective measure, be one of the greatest adventures of my life. I came upon this memento as I was looking through old saved copies of the Daily while preparing for one of the interviews with the search committee, and then — and now — it gave me a moment to pause and to reflect on the meaning behind it. What was I thinking then as I was about to drive across the country to continue my studies? And what does it mean now as I begin this journey at Chautauqua? How funny that in one instance I was being sent off from this place and now, I am returning home to these shores and this grove. As I was preparing for today, I began to think of the headlines of my own life; those in which I have played a role, others I have written, and — mostly — those that are the result of difference-making decisions and challenges overcome. And, now, as I join with the Chautauqua community at this point of celebration and eager anticipation — of dreaming and wondering about the 2017 season and all that will follow — I find myself asking: What will be the headlines of this season? What will be the headlines of the future that capture and characterize the mission of Chautauqua Institution? Who will read them, and what invitation to the world might they suggest? Of course, as my predecessor Tom Becker will remind me, on both a Chautauqua president’s best and worst days, I don’t get to write the headlines anymore. And before I continue, please allow me to take a moment to acknowledge the incredible generosity of spirit, the graciousness and care with which both Tom and Jane Becker have received me here. A new president could not ask for a more helpful and compassionate duo. I had a chance to share the stage with Tom on Friday for a celebration of the Promise Campaign that Chautauqua just concluded. It was an honor to do so and a greater honor to follow Tom in this role. He and Jane have my thanks for the many headlines they sculpted for Chautauqua. 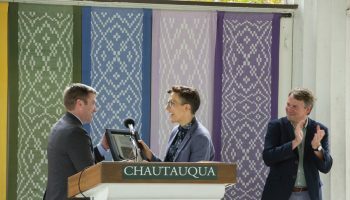 But truth be told, I believe that all of us here and the thousands of returning and new Chautauquans who will pass through the gates of this sacred space — all of us —have the opportunity to play a role in shaping the headlines of Chautauqua’s future. For those long-term Chautauquans present today, you might get a chuckle about ways that rumors start and race through our community — yes, even when you’re not present. One of my favorites is that I came here with a prepared 10-year plan for Chautauqua. If any of you has found it, can you please bring it to my office in the Colonnade? 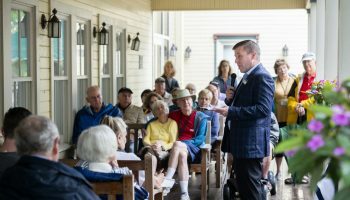 While I did not come with a decade-long roadmap, I did arrive here with a vision of the important role that Chautauqua might play for our world in this moment. I hope you’ll allow me to offer some suggestions about core commitments and ideals that can frame and shape this new era. And in pure Chautauqua fashion, I hope that this beginning thesis might create even more questions and answers from which you and I, together, might realize a bold response to a world with Chautauqua at its center. Our founders, Lewis Miller and John Heyl Vincent, were onto something when they created Chautauqua in 1874. Their story —our story — is a familiar one to many Chautauquans, but if you haven’t heard it, imagine what was happening in the nation at the close of the 19th century. Leisure time was just becoming a possibility for many Americans, but to take a vacation would have been considered a luxury only for the wealthy, and even then, not in vogue. Miller, the Ohio businessman and philanthropist, and Vincent, a Methodist pastor, would create an initial idea for a Methodist Sunday School Assembly that would quickly blossom into something much bigger. It would provide a training ground for preachers and teachers to come together, not for vacation, but for an experience of lifelong learning that would allow its participants to return to their home communities and do good in the world. But what they really did was much more profound and, I would argue, provides clues to a reinvigorated vision of Chautauqua in a very different time frame in the world’s history. • A promise to listen and to learn. • A promise to be responsible citizens in our communities. • A promise to seek the best in human values, not for the pursuit alone, but to shape a better tomorrow. Our promise to listen and learn starts with a reflection on our rich and storied history. If Miller and Vincent’s hurdle was how society framed leisure time, I would posit that our challenge today is not how we spend our time but rather our ability to spend time together. I was in Washington, D.C., the weekend of Jan. 20, and on that Saturday attempted to ride the Metro to a friend’s home in northern Virginia. This should have been a relatively quick trip, except that I had not taken into account that that weekend had just hosted two major events: the inauguration of Donald Trump as president of the United States and the Women’s March on Washington. One might argue that there may not have been in the recent history of our nation two events so divergent within 24 hours of one another. As I rode down the escalator into the Metro station, I was engulfed by hundreds of people waiting to take the train. This petri dish of a sociological experiment is the perfect example of what we are facing as a society today, and not for the reasons you might think. While certainly these two events might most simplistically be seen as great assemblies of the left and right, it was not, by far, that simple. What these two groups did represent was the complexity of America today. Each contained people from conservative and liberal walks of life, each contained people of means and those on the edge financially. There was a rainbow of colors in both groups, people with strong convictions of why they had shown up for either event. Chautauqua has often been called into service when the nation and its leaders couldn’t find an answer. When the world was in the midst of one of its worst conflicts, President Franklin D. Roosevelt came to this Amphitheater to give his now-iconic “I Hate War” speech. And when the U.S. and then-USSR were most struggling with how to talk with one another, Chautauqua created the U.S.-Soviet conferences, bringing everyday citizens, along with thought leaders, together for three years to help explore a pathway to peace. As someone who most recently came from an organization designed to create citizen diplomats, I can attest to the power of this model. So what is today’s prescription for society? I would argue that what Chautauqua must provide the nation is an example of how to listen — how to truly listen. Krista Tippett, the journalist and host of “On Being,” writes in her New York Times best-selling book Becoming Wise that the moniker of civic dialogue is so often used and so seldom realized that the phrase no longer carries meaning. She advocates that if the world truly wants to come back together through dialogue, we better add some adjectives to the beginning of the phrase. My preferred adjective is that we need a “muscular” civic dialogue for this time in our nation. Gaining muscle takes hard work, repetition and practice. It’s not the easy answer, and it doesn’t come in a day. At the heart of a muscular civic dialogue is the art form of true listening. My question as we start a new season at Chautauqua is this: Can this community do what our nation seems incapable of at the moment? Can we mirror, model and practice this form of muscular civic dialogue? Can we graciously invite viewpoints at the polar opposites of our own with the patience and fortitude needed to truly understand? On the face of things, this type of listening and inquiry seems like what we always do here at Chautauqua, right? As some of you may know, I crisscrossed the country these past six months trying to meet as many Chautauquans as I could before the season started. In each city or town I visited, I was quietly greeted by Chautauquans who consider themselves conservative, and what I heard from them was a yearning to join the conversation, and an acknowledgment that they don’t feel that Chautauqua currently is welcoming to that. In our efforts to be enlightened citizens of the world, can we start by acknowledging that all must be welcome at our table if the dialogue is to be fulsome? There was a wonderful TED Talk I recently heard called “10 Ways to Have a Better Conversation” in which the speaker Celese Headlee asks, “What would happen if we entered every conversation assuming we had something to learn?” If we believe we have something to learn, we would focus more on listening and less on trying to emphasize our own point of view. And the famed therapist M. Scott Peck heaps on to the prescription, declaring that true listening requires a setting aside of oneself. And sometimes that means setting aside one’s personal opinion. He said that sensing this acceptance, the speaker will become less and less vulnerable and more and more likely to open up the inner recesses of his or her mind to the listener. Again, assume that you have something to learn. We have a unique opportunity to practice this at Chautauqua, because among the many things we are, we are a community — some might say a family. I need to acknowledge that I join this community as your new president after some contentious debates about the future of our beloved Chautauqua. I’m reminded that people can get fiery when they care so deeply about something. Families are like that, aren’t they? Rumi, the 13th-century poet and Sufi mystic, said, “The wound is the place where the light enters you.” We are invited to see the light in all challenges; to learn their lessons and become a stronger, more engaged community as a result. While I don’t think it’s helpful to re-litigate old debates when the outcome cannot or perhaps should not change, I do want to thank those of you who may not have always felt heard in our family. You helped me understand the rich complexities of this special place; may this be a season of healing and renewal for you. Not an easy thing to do always, but I have faith in the goodness of Chautauquans. I look forward to embracing the light together. As we start a new season, I ask each of us to promise to listen — not for the affirmation of what we believe (if we do our jobs right at Chautauqua, you will find days where that happens and days when it does not), but rather to lean into those moments when that which we believe is challenged. Instead of clapping when a point we agree with is made, which sends a signal to those that don’t agree with us that their opinion isn’t valued, or booing when our invited guests challenge our own assumptions, can we instead lean into the question and truly try to understand? Can we consider those challenges not an affront but a blessing disguised as an opportunity to understand? Can we pledge ourselves to a season of true civility? Of muscular civic dialogue? Will you take this pledge with me? If we could do this important work then perhaps we might make even greater strides than Chautauqua ever has. Our promise to be responsible citizens in our communities reminds us that an organization of our size, impact and potential cannot rest on the laurels of our “economic impact” as the sole contribution we make to our local communities. It has been a true delight to watch the grounds transform from the quiet, beautiful, snow-covered calm of the winter season that greeted me in December to the unfolding beauty of the spring. I have watched, with great delight, porch wraps disappear, gardens come alive, and one by one, two by two — sometimes four by four — Chautauquans returning to their homes. I have greeted so many who tell me that passing through the gates each spring is akin to a religious experience; a moment of renewal and rebirth. To many in this incredible Amphitheater — and many more joining us online — the gates of Chautauqua Institution call them to a place of intellectual and spiritual wonder, invigoration and exploration. Chautauqua’s 15th president, Dan Bratton, argued, rightfully so, that one need but enter the gates once to be considered a Chautauquan. At the same time, our gates have, for generations, represented something very different to our region’s citizens, to our first-time visitors, and to the casual passers-by enjoying the beautiful Western New York landscape on a sunny afternoon. To many, our gates speak of barriers; something that separates “us” from “them”; a siren that exclaims: Keep out. You are not welcome here. 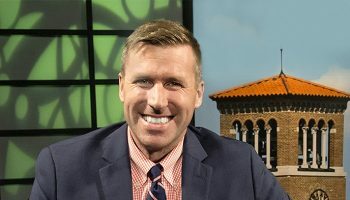 I invite you to join me in envisioning what we can do literally and figuratively to transform our historic gates into gateways; to take active steps to diversify the community of citizens who consider themselves Chautauquans; and to overcome some of the economic and ideological barriers that gates sometimes represent. As I have engaged with Chautauquans across this country, among the questions that seem to resonate most deeply is this: How can we claim to be the convener of some of the world’s most important conversations when so much of the world is not represented at our tables, pulpits, podiums or porches? Transforming our gates into gateways demands that we open our hearts and minds to an experience of the other. Chautauqua must once and for all find a pathway toward achieving true diversity in our programming, on our grounds and in our conversations. And that diversity must be embraced in its most expansive form: by age, by color, ethnicity, sexual orientation, by people of all economic backgrounds, by people of all faiths and none, and by all walks of the political and ideological spectrum. We cannot only share dialogue with those who look and act like us if we intend to live into our mantra of exploring the best in human values. Human values are not monolithic just as human beings are not. I recently spoke to the Jefferson Society in Erie where we unpacked some of the mysteries of the millennial generation. I continue to hear that young people won’t come to Chautauqua. Let me state without reservation that I simply do not believe this is true. And the statistics back me up. Nationally, millennials are patronizing arts and cultural organizations in growing numbers. They are fans, and they are more likely than other visitors to return — and quickly — to an experience they enjoy. But young people don’t convene in the same ways than their more senior counterparts do. If we truly want to welcome and keep young people, if we want to ensure that successive generations come to these shores, then we need to re-examine our approach. Allow me to share a story. I was recently visiting with a young person who had all the characteristics of a classic Chautauquan: loved the arts, intellectually curious, spiritual yet not religious with a deep affinity for exploring the complexities of the world and loved nature. I said, “Chautauqua is perfect for you!” He responded it was anything but. I was befuddled. I asked, “Well, why not?” He started by saying, “Well, first of all your name is Chautauqua Institution. We don’t trust institutions.” I responded that he might consider simply calling it Chautauqua and move on. I said, “OK, well how do we invite you in?” His reply: “You can’t invite us in. It seems too manufactured. We need to discover the place for ourselves and then we have to invite others like us in.” At some point, I had to confess to him that the generation behind him was not quite this difficult and he was making me consider that perhaps we might just skip a generation in our approach. After many more hours of conversation, he asked me a question that unlocked his approach. He said, “Where are most of the young people in their early 20s and 30s on the grounds.” I responded, “the Arts Quad.” He said, “Build a bricked plaza overlooking the lake with a perpetual fire pit and lots of Wi-Fi — and do not program it! We’ll find our way there and we’ll find our way into Chautauqua.” It’s a different way of building community and convening. Becoming more diverse will also require us to become more affordable to a wider range of income groups. The coming years must provide a solution to affordable and varied housing options and fee structures. We must find a way to diversify our revenue streams while widening our reach and impact by significantly expanding shoulder-week and year-round programming. I believe that what happens during our nine-week season on the grounds will always be the purest manifestation of the Chautauqua ideal, but our work is too essential to be limited by its physical boundaries or only the warmest months in Western New York. We need to reach individuals and families who can become fourth-generation Chautauquans even if they’ve never set foot on the grounds. If Chautauqua is the incubator for a new form of muscular civic dialogue, then technology is the amplifier. It lets us propel our ideas and approach beyond the gates, creating virtual tents in which seekers can hear and discuss provocative ideas and listen to and debate diverse opinions. In short, we must create a mental space that offers some of the same advantages as a physical place. Those words, “space” and “place” are not the synonyms nor can we look at our approach as if they are. Imagine the good that Chautauqua could do if it found a way to create distinct, apolitical, digital experiences where we can present ideas, pose provocative questions, and engage people in genuine dialogue. And as FDR reminds us, this work is best when it begins at home. Chautauqua is located in one of New York state’s most economically depressed regions. As responsible neighbors, we must explore ways to invite more local participation inside the gates and to strengthen existing relationships with local school districts and nonprofit partners to enrich content. Some of the most uplifting moments, some of the purest Chautauqua moments I’ve experienced, occurred when we welcomed hundreds of regional young people to the grounds for Battle of the Books, for the Young Playwrights Project, and during this past week to view the galleries before many resident Chautauquans returned. I believe we have a moral obligation to serve our immediate community, to transform their idea of our gates into gateways for a brighter future for those that live closest. Imagine what good we might do if instead of claiming that this is the place where they are not welcome, they believed, with good reason, that this is their Chautauqua that others borrow for nine weeks in the summer? Our third promise — a promise to seek the best in human values, not for the pursuit alone, but to shape a better tomorrow, is the centerpiece of Chautauqua’s “why.” This is why we were founded and it is why our mission is more important today than ever. One of my great regrets of not being in place last year was missing Wynton Marsalis and Jazz at Lincoln Center. Wynton certainly gave us an outstanding example of the ways in which the arts, and artists, are often the truth-tellers and guides for a society that has lost its way. And my former boss and dear friend, Molly Smith, artistic director of Arena Stage, noted that the arts “involve a search for truth, not the hiding of it; a critique of power, not the exercise of it; an invitation to conversation and insight, not a shutting down of dialogue. … There has to be a diversity of voice to represent all of our views. Think about Lorraine Hansberry and A Raisin in the Sun or Lillian Hellman and Watch on the Rhine. Think of Tony Kushner and Angels in America or August Wilson and Joe Turner’s Come and Gone. And yes, think of Lin-Manuel Miranda and Hamilton. Just as our speakers will push us to examine hard truths, and our preachers will invite us to double down on a journey in faith toward a more harmonious society, I look forward to a season where our artists — young and old — invite us to connect to our deepest emotions. Artists have always been some of the greatest commentators on where society might go, or a deep reminder that goodness and beauty are always present if we simply are open to them. If these are the three promises inherent in our founding, if this is the “why we do what we do,” then it’s only fair to reflect on just “how” we might consider living into these promises. And as someone that values symmetry, please allow me to offer three broad mandates. We must strengthen this sacred space; meet our audiences where they are today and anticipate where they might be tomorrow; and grow our networks. As stewards of an American icon, we are honor-bound to pass Chautauqua on to the next generation better than we found it, and to ensure that we use the buildings, the grounds and the lake to maximum impact. On Friday, we celebrated the successful conclusion of our Promise Campaign, which brought, among other important advances, this incredible Amphitheater. But we cannot rest there. There is much left to do to preserve and refresh these sacred grounds, to more fully live into our Chautauqua movement. And that includes the conservation and stewardship of our beautiful lake, a source of recreation, contemplation and inspiration. We need a healthy examination of what additional public gathering places will make it easier for guests to gather informally and extend the conversation. We must improve the level of technology and information systems to support and sustain our 21st-century non-profit mission, and in a way that complements the pastoral setting that we all cherish. We have to make sure we have the right blend of plug and unplug. Today’s young people — and I would argue many others — depend on technology and lots of Wi-Fi. It is time for Chautauqua to think out of the box and explore technologies beyond what may be readily available in the moment. Amazon’s Jeff Bezos suggests that organizations that aren’t considering how artificial intelligence and virtual reality impact their business model will be left behind — and quickly. • offer content for use in online learning platforms? • encourage on-site guests to continue the conversation with online guests? • offer up a body of work that doesn’t end after nine weeks but extends theme-related dialogues from one season to the next? • hold a four-part lecture series on what makes a nation great; feature a segment on religion, one on civic discourse, the role of the arts, the central place of fitness in the exploration of wellness? • develop an app that allowed you to read the bio of a presenter, buy her book and reserve it at the bookstore all while making your reservations for a table at Heirloom and tracking where the on-grounds transportation might be at any given moment? • empower Chautauqua alumni to start online conversations in their own communities. The CLSC coined the model for this. And there are still needed repairs and enhancements to our buildings and our natural environment. We can find a way to use our convening power to bring thought leaders together in a peaceful, neutral setting. Chautauqua’s tranquil setting and inviting environment form the perfect backdrop for groups that need a quiet and immersive experience — not just for initial conversations but for the ongoing dialogue. Our Lincoln Series in Applied Ethics has for years called us to think about how learning, infused with intent, could and should lead to actions that make a difference in the world. Can we harness the vision that David Lincoln provided us many years ago and realize its power in the world? It’s time! Our founders were prescient in many ways, and the modern adaptation of that is more critical today than ever before. Chautauqua not only must affirm its commitment to religious exploration, but it must also modernize its approach and open wide the gates to people of all faiths and none. At the heart of so many of today’s controversies is a lack of understanding that the central tenant of every major faith shares a common prescription for healing the world. While God may be called by many different names, the search for peace and justice and kindness is prevalent in all faiths. Chautauqua must build interfaith coalitions, not to diminish our Christian heritage but to affirm that at the heart of that founding faith is a mandate to love one another and to seek understanding. We need more artistic residency programs in the off-season. We have the facilities and the know-how, and we have a population who could thrive through access to the best in arts education. The wish list is understandably limitless, as is the potential for what we might do with our beloved Chautauqua. It is not enough for Chautauqua to be timeless. We have to be timely as well. To continue to attract a younger demographic, as well as recruit and retain a broader constituency across every dimension requires us to take a hard look at our brand, our programs, and even our vocabulary. Fewer guests coming for the entire season makes reliance on entrance and performance fees problematic. We must explore and address the issues behind the attendance and renewal rates as well as create program options for shorter-term and weekend audiences that help make new believers and lovers of Chautauqua. We can and must add more passion in programming and make it more connective year-round. Millennials are yearning for connection. We must diversify our speakers and contemporize our offerings. Chautauqua has long been a training ground for aspiring professionals in journalism, the arts, clergy formation and nonprofit management, but we lose touch with them when their pre-professional experience ends. It’s time to create a pre-professional alumni engagement strategy. We have all the ingredients to transform our literary offerings and literary prize into a powerhouse brand-builder for the literary arts. We have one of the oldest book clubs in America. It’s time to claim that heritage and grow it more fully into a central part of Chautauqua. And the tricky part is that we must do all of this in a way that “decodes” Chautauqua for first-time visitors. Chautauqua will never accomplish this ambitious agenda on its own. To amplify our voice and extend our presence we will look to expand our network of partners and grow the next generation of philanthropists. Relationships with significant national partners, such as National Geographic and the Center for Strategic and International Studies, allow us to simultaneously deepen and broaden our programs in a way consistent with Chautauqua’s ideals while reaching new audiences. A new President’s Advisory Council on Faith in Society will help redefine the exploration of faith and religion for the coming decades. These early examples demand that we recruit partners in all of our program areas to strengthen our reach and our impact without breaking the bank. 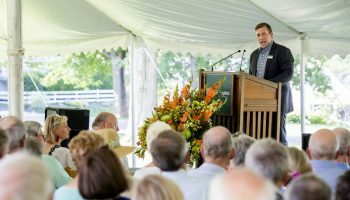 And while we celebrate the incredible generosity that we have already seen at Chautauqua, we must strengthen philanthropic support in new ways. The days when donor support was merely a boost to the bottom line are long gone. In today’s thriving organizations, philanthropy is a robust and essential funding resource. It is the margin of excellence that often turns good institutions into great ones because it confers the ability to seize unexpected opportunities, to invest in promising programs and ideas, and, perhaps most importantly for Chautauqua, to underwrite the cost of admission for hundreds who have the passion to attend but not the means. Author Anthony Doerr reminds us, “Time is a slippery thing: lose hold of it once, and its string might sail out of your hands forever.” With that perfectly constructed caution, I will bring my musings to a close. To paraphrase the words of President John F. Kennedy, this work will not be finished in a year, nor in a decade, nor perhaps even in a generation. But let us begin. And let us be bold. I tap the gavel three times. Look forward to this next chapter of Chautauqua. Once we bring these three promises home, Chautauqua will be a beacon to the world of how civil debate leads to ideas no one individual could imagine.